Mayflower II’s massive frames are spaced close together and reveal the full shape of her hull. Massachusetts, where the Pilgrims landed in 1620. 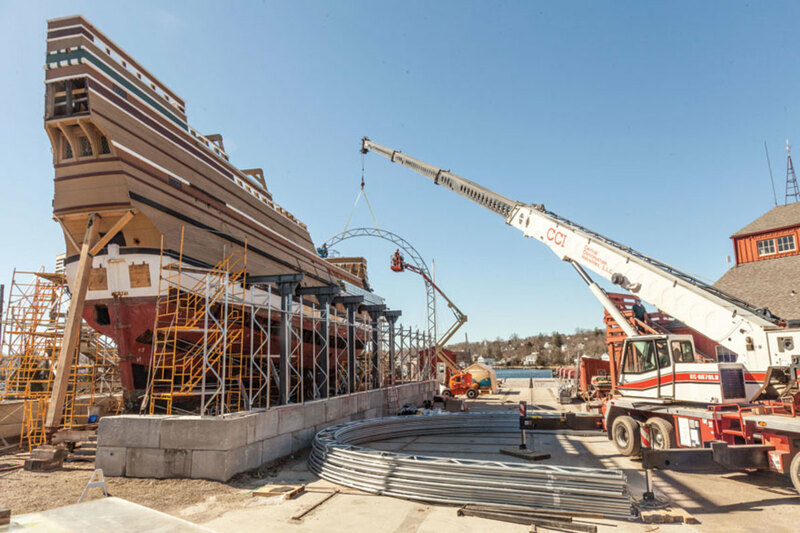 For the next year or so, however, Mayflower will be in the preservation shipyard at Mystic Seaport Museum, where her three-year refit has been taking place. It’s worth a visit. At the shipyard, the rich scents of newly worked white oak and longleaf yellow pine waft through the air, mixed with whiffs of linseed oil. Caulkers’ mallets ring, the ship-saw whines and, occasionally, an adze thunks in the background. In her partially disassembled state, Mayflower provides curious visitors the chance to peek at parts normally out of sight. Shipwright Chet Kason applies linseed oil to preserve the wood. Of course, the ship being restored is not the original Mayflower, which carried Pilgrims to Massachusetts. This is Mayflower II, the ship constructed in 1955-1956 at the Upham Shipyard in Brixham, England, and presented to the American people — under Plimoth Plantation’s stewardship — as a mark of respect for the World War II alliance of the United Kingdom and United States. The original Mayflower had been long lost, the normal fate of working ships. 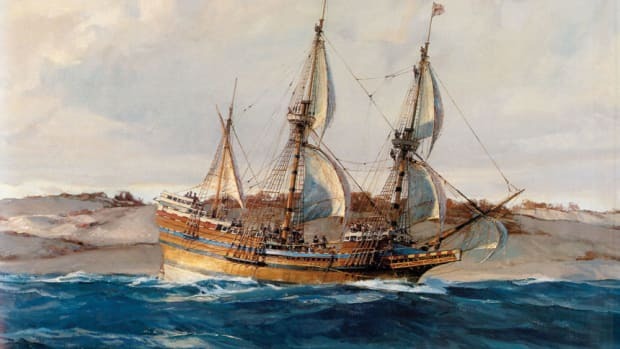 By the 1950s, however, maritime historians understood enough about early 17th-century vessels that naval architect William A. Baker could design an 85-foot hull displacing 180 tons burden — a vessel probably quite similar to the ship the Pilgrims knew. With her towering stern castle, elaborate Elizabethan beakhead and rakish bowsprit, she looks rather roly-poly. But she was seaworthy. Capt. Alan Villiers and his crew sailed her across the Atlantic without a propulsion engine in 1957. Sledgehammers are essential. Trunnels and spikes are all driven by hand. 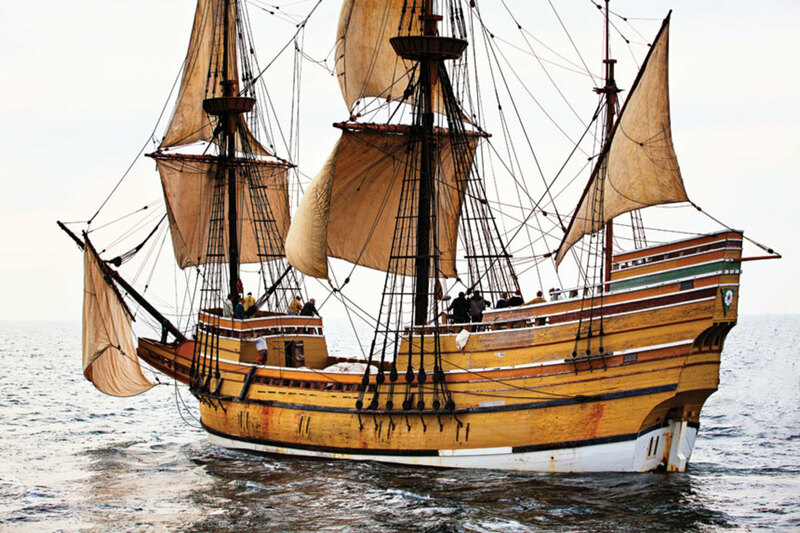 Mayflower II is historically important in her own right. She was one of the first square-rigger reproductions in the 20th century, preceding the wooden ship revival by decades. Her current refit is following the Secretary of the Interior’s official guidelines for historic restoration. The goal is restoring Mayflower II as she was built. For instance, scholars know that normal practice in the 17th century would have been to square futtocks on only two sides. (Futtocks are the separate pieces of timber that together form a frame, or rib.) When Mayflower II was built, however, shipwrights squared her futtocks on all four sides, as would have been common during the 18th or 19th centuries, so that is what the restoration shipwrights are doing now. Like their predecessors, they are fastening her with black locust trunnels (slang for “tree nails,” a form of wooden dowel) and galvanized spikes. Occasional changes are being made. 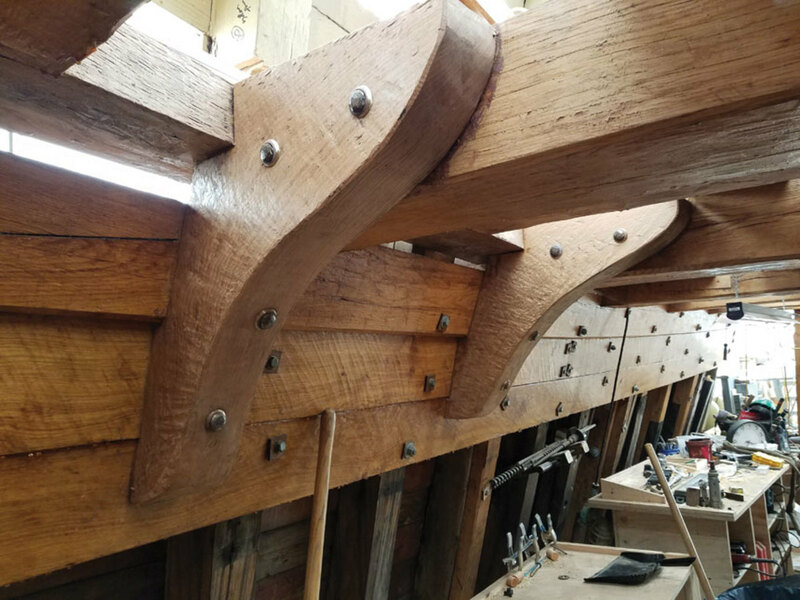 The U.S. Coast Guard wanted the spikes connecting keel, keelson and floor timbers replaced with keel bolts. That’s been done. Whit Perry, director for maritime preservation and operations at Plimoth Plantation, is a big guy with a big smile. 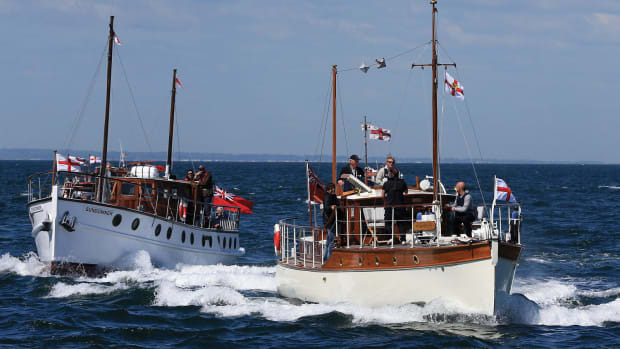 He has more than 30 years of working on historic ships under his belt, as well as considerable experience as a skipper of schooners and modern yachts. As a kid, his first restoration was an Old Town canoe, and he has been bitten by the bug ever since. He has now been at Mystic Seaport for several years as a senior representative for the project. As Perry sees it, the restoration is a “fantastic collaborative effort” between two not-for-profit institutions that value historic stewardship. 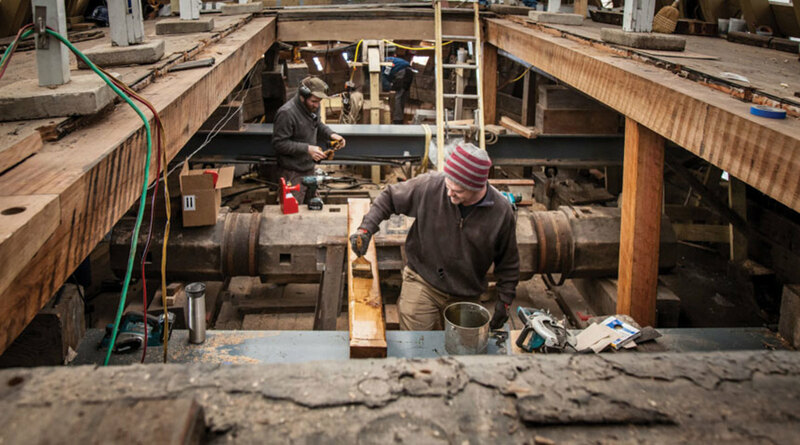 That collaboration began in earnest in 2014, when Mystic Seaport finished its restoration of Charles W. Morgan, the world’s oldest wooden whaling ship. 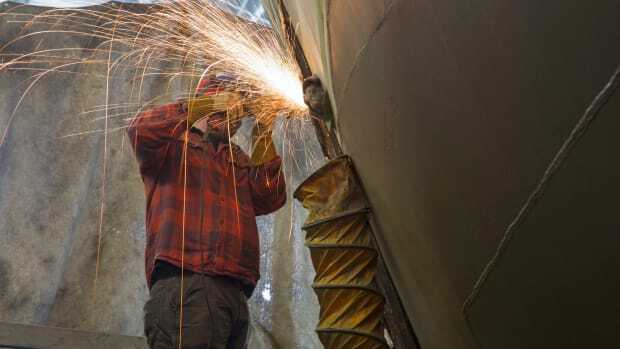 Quentin Snediker, director of the Henry B. DuPont Preservation Shipyard at Mystic Seaport, told me that his crew had “momentum” at that point — the procedures, the tools and the skilled carpenters who had worked under lead shipwright Rob Whalen to rebuild the Morgan. They were eager for another signature project, where the scale would be hundreds of thousands of work hours, years of planning and labor, and unparalleled historic significance. Mayflower II fit the bill. She had been an attraction vessel for many years, tied to the pier at Plimoth Plantation’s exhibit at Pilgrim Memorial State Park. She needed much more than a coat of paint. Mayflower II broad reaching in 2014, shortly before restoration began. In-depth assessment began in the fall of 2014. A tug towed her to Mystic. Her 130 tons of ballast was removed to expose the inside of the lower hull. A team of experts was assembled: Perry, Snediker, Whalen, representatives from the U.S. Coast Guard and Paul Haley, a marine surveyor with knowledge of wooden vessels. 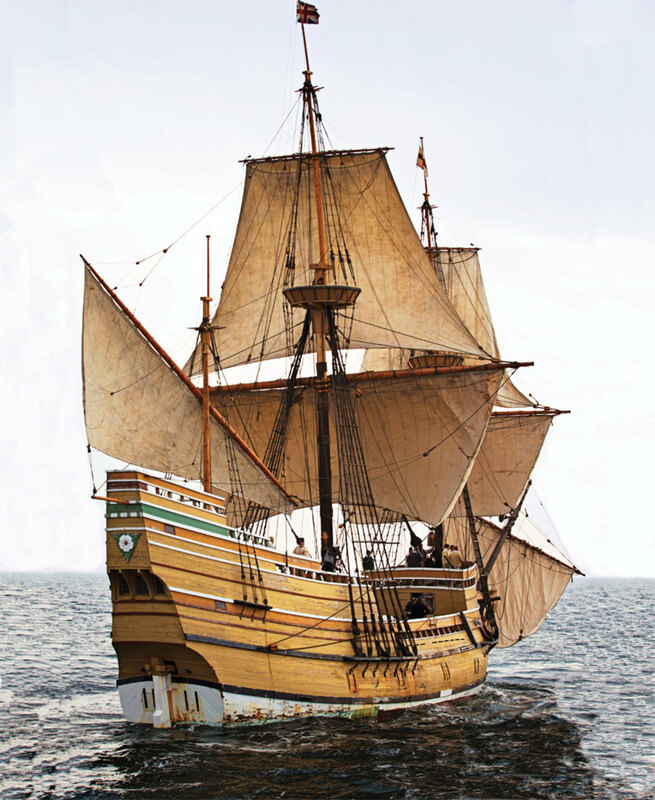 Initially, the hope was to have the ship in Mystic during late fall, winter and early spring, and to return her to Plimoth Plantation for summers, when she is a major attraction and economic spark plug for the whole town. So she returned to Plymouth for the summer of 2015 and then came back to Mystic in the fall, when her half-deck was reframed. By then it was clear that half-measures would not suffice. The ship had been well built, but she was seriously deteriorated, and the experts realized that they were looking at replacing about 70 percent of her structure. She would need three years in the shipyard. Plimoth Plantation launched a fundraising campaign to save the ship and quickly secured commitments from the Commonwealth of Massachusetts, as well as a prominent Boston philanthropist. In all, the restoration is expected to cost about $9 million. That’s a bargain; a brand-new ship would cost closer to $16 million. Above, shipwright Nathan Adams mortises a deck beam for the half deck. Wooden ships require special timber – lots of it. Perry sourced 20,000 board feet of white oak from a royal forest in Denmark that has existed for three centuries to provide ship timber. The Danes provided oak timbers 38 to 40 feet long, 3 inches thick, and 24 to 30 inches wide, without knots or defects. It is astonishingly beautiful and strong wood. That was just the beginning. Mayflower is a national icon. Fittingly, she is being rebuilt with wood from around the nation. Some has been repurposed, including wonderful lengths of longleaf yellow pine built into a Groton, Connecticut pier during the 1890s. The pier came down about 25 years ago. Its beams — beautiful resinous wood — are now being worked into the upper structure of Mayflower II. Berea College in Kentucky, which has managed a forest for 150 years, provided white oak for futtocks and double-sawn frames, as have woodlots in Massachusetts, Connecticut, Ohio, Virginia, Georgia, South Carolina, Mississippi and Louisiana. Old-growth Douglas fir harvested on the West Coast during the 1970s has been acquired for the decks. Its growth rings are as tight as you will ever see. New live oak hanging knees have been installed under the half deck. Projects like this cultivate talent. Snediker says that, for decades, Mystic Seaport’s shipyard has been doing large timber work. 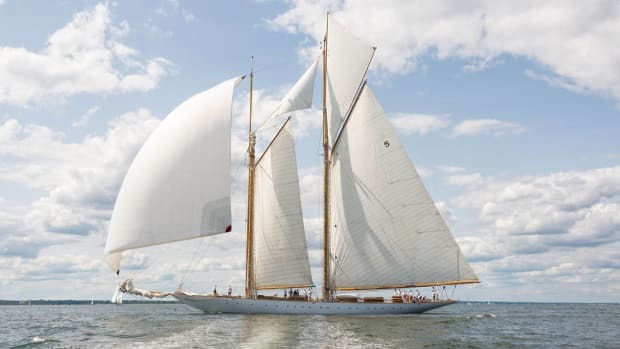 Graduates from the International Yacht Restoration School in Newport, Rhode Island, naturally gravitate to the shipyard. 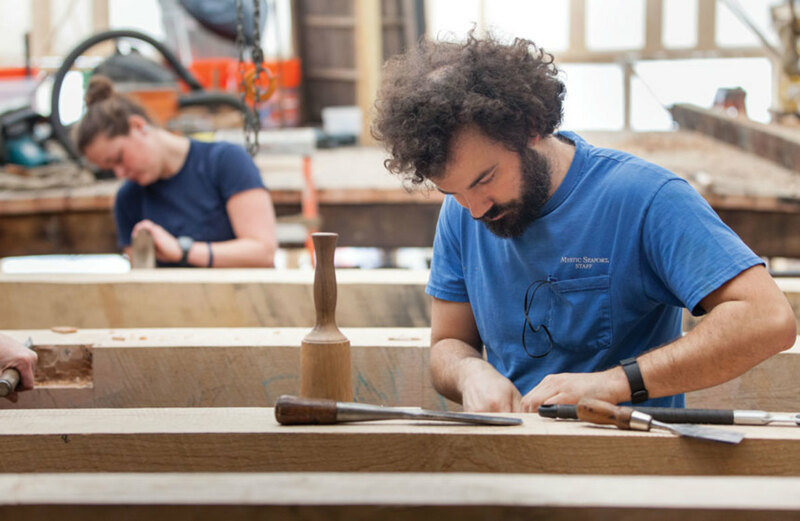 The current crew of 30 includes numerous IYRS grads, including Matt Barnes, lead shipwright on Mayflower II. Dylan Perry, Whit Perry’s son, is a chip off the old block. 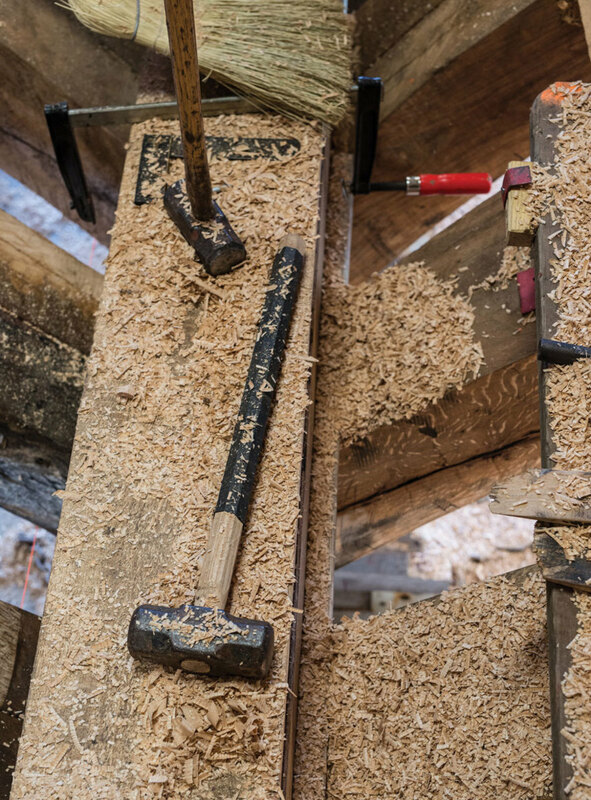 He is a sawyer and woodsman who takes timber “from tree to sea.” Dylan and the other sawyers are milling live oaks from Belle Chasse, Louisiana, and elsewhere, coaxing the right shapes for hanging knees and floor timbers from gnarled trees. Nathan Adams, a shipwright with a master’s degree in maritime history, is framing and converting flitches (slabs of timber cut from tree trunks) into futtocks. Hauled, blocked, and braced with steel I-beam supports running through its gunports, the ship is being covered so work can proceed in all weather. With so much talent at their disposal, the managers have four gangs working on four areas at a time. It is a piece-by-piece restoration, in which sections are carefully removed, thoroughly documented, and then replaced. Such disassembly is only possible because the ship has been stabilized in every direction. Five massive steel beams, resting on supports on the ground, run athwartships through Mayflower II’s gunports. Two fore-and-aft steel box beams run the length of the ship, one on each side. By the time the restoration is finished next year, Mayflower II will have all new systems, including a Cummins diesel generator, modern pumps and emergency lights, along with a new suit of sails, considerable new rigging, and a new foremast and mizzenmast — plus a hull refit that should make her as good as new. The year 2020 is the 400th anniversary of the Pilgrims’ arrival at the site that would become Plymouth, Massachusetts. Mayflower II is scheduled to be at the center of the celebration. A historic artifact restored to breathtakingly high standards, she should turn heads and inspire imaginations for the next 62 years. Or more.